Who is your favourite Newcastle player of all time? | NUFC Blog. Who is your favourite Newcastle player of all time? Talking about our favourite Newcastle players is always a good way of stimulating debate, so who is your favourite player of all time? It’s a question that encompasses the different tastes of people, different age groups and different opinions as everyone has their own reason behind why a particular player is their favourite. For me, it has to be Peter Beardsley. The guy was a magician with a football at his feet and was a model professional at all times. Of course he is now our reserve team coach, but some of his skills will live with me forever. Paul Gascoigne is another player who could have been up there, but although he was my first Newcastle idol I don’t think he was here long enough to trump Pedro’s efforts. 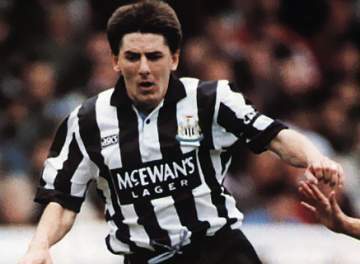 I’m not old enough to really remember his first stint at Newcastle, but in his second coming during the Keegan era, Beardsley was equally as exceptional. Some of his goals were fantastic, and I dare say Andy Cole wouldn’t have scored as many goals had Pedro not been flitting around next to him. It may come as a surprise to some that I haven’t chosen Alan Shearer as my favourite. He was exceptional, but he was very much a player that relied on the team. With Beardsley you could expect comittment and the unexpected in equal measure, he could do magical things all by himself. There have been loads of idols down the decades, from all over the pitch. We all have our own reasons for having a favourite, so why not share yours? I’ll pick out the most popular players, borrow some comments, put them up in an article, and then we can have a vote on it. So come on then, who is your favourite? From another era – interview with a former Toon player! NUFC – Some Things Never Change. SHEARER the plain and simple reason why i support and love newcastle biggest legend ever..SHEARER..SHEARER..SHEARER! David Ginola, one of the most graceful players I’ve ever seen. Beardsley for me with Big Al a very close second. Wor boy Peter runs like a Cheeter. TONY GREEN / TERRY HIBBIT,hard to decide,but both class acts!!. Tony Green the most skilful player ever to don a black & white shirt. What a pity he couldn’t have played more games. SHEARER without a doubt! I think it’s very harsh to say he relied on the team. Pre his serious knee injury in 97, when he was mobile and fairly quick, I saw him win matches for us single handed. He pretty much won a very average Blackburn side the title by himself, scoring 130 goals in 171 matches. Yes Beardsley had quick feet and great vision and was an exceptional player, I’d say he was similar to Bergkamp, but he wasn’t as consistent as Shearer and could never score as many goals as him. I think Shearer when first season he come back home is the best striker I ever seen. Twice of Rooney now. He’s the reason I support Newcastle since then. I am honoured that some of you still remember me. My 12yr old heart was broken in 1976 when Dracula sold Supermac. What an awesome sight he was in full flow and bearing down on the opposition keeper. Power and immense speed with great finishing. There’s only one ALAN SHEARER.best finisher I’ve seen.since he retired nobodys stood out to me as my favourite. Would like to see him manage us again. Peter Beardsley for me. With Nobby Solano a very close second. Supermac was more exciting than Shearer to watch. But every decade for me has had a legend. Kicked off in the sixties with Pop Robson who never got the England caps he deserved. The seventies was Supermac. Reliant on Hibbitt for the amunition but Supermac was a real centre forward.His two goals against Burnley at Hilsborough will live me forever. The eighties was Pedro first time round and he was simply one of the most skilful players of his time. Ginola owned a football pitch and sometimes two balls were necessary one for him and one for everybody else. Shearer was the latest. The guy was a sheet metal worker son who lived the dream and played for his club. Sacrificed medals at manure to do so. Robert Lee was an awesome player and like you say often overlooked even then as well. I remember he scored a goal from the half way line and it was disallowed for some unknown reason. When Beckham scored his goal from the half way line the whole bloody world knew about it lol. I watched Rob Lee in a charity match not so long ago and he has still got it lol. He would put a few of our current midfielders to shame. He loved NUFC and he didn’t have an ego like Alan Shearer or Ginola, Lee just got on with his game alot like a certain Giggs who is a model pro. Supermac’s sale was my first vivid Newcastle memory. I guess it was also the herald of everything which was to follow! Laurent robert everyone knows, his name . Who is the worst player you have seen in a NUFC shirt? There is no point in batting this to and fro’ between us, but I have never written anything without researching it thoroughly. It’s my job. I have never written anything about Newcastle without researching it and have not got any facts wrong in any of the pieces I have written about the club. You obviously disagree with my conclusions and interpretations, but that is not the same as mistaking booing the ref for booing the team, which is just a ridiculously slipshod error. I don’t — and never have — doubted the passion of Newcastle fans. What I object to is the assumption of many — not all, of course, but many — Newcastle fans that theirs is a special devotion. That preposterously pompous self-image insults the passionate supporters of other clubs. Had to be seen to be believed as to how exciting a player he was. For my son to be — Peter Beardsley. For me, there are a few real stand out names. I loved Shearer for his devotion and his goalscoring abilities. I loved Gary Speed for his nitty gritty work and for being a model professional to those around him. But my absolute favourite has to be Philippe Albert. He was such an amazing player. Although he was occasionally caught out in defence, his ability to pick out a pass and to bring the ball out of defence was great during the 90’s near-glory days. And being that I was a youngster at the time, playing in defence for my school’s team, Albert was a player I used as inspiration. Shearer, no doubt. That’s why I became black & white forever. When I first used to go to games the fans on the popular side used to take the micky out of Frank Clark. Solid enough defender but just used to boot the ball off the pitch. The same guy went on to win the European Cup. Given a few seasons Tony Green would have become a true legend. His career was cut cruelly short after his transfer to the Toon. Otherwise – Peter Beardsley was the most enjoyable player to watch. Shearer may have got the goals, but Lee was the heartbeat of the team for almost a decade. Gary Speed also deserves a mention for what he brought to the team, he was a proper pro – something we’ve lacked for some time in the side. Beardsley and Ginola were probably the two most skillfull i ever saw play for us (too young to remember Gazza) but Rob Lee was just the man. Peter Beardsley. A total one off, scored goals no one else could, saw passes nobody else could see. Funny, I was just going to say no one’s mentioned Paul Gascoigne. Bobby Mitchell was a left winger with pure magic in his feet, he could undress a full back and just for fun he would do it again and again. Later, and probably my all time favourite, would be George Eastham. He was silky smooth and go go through a defence without being touched. He stroked the ball with finess that is a rare gift and could split defences at will. there was many great players to come in and out of newcastle but my personal favourate only cos i enjoyed his style was faustino asprilla for me especially what he did for us against barcelona getting that hat trick wow! Shearer was the best centre forward and goalscorer. Bob Moncur was the best defender, closely followed by my favourite defender Philippe “5 NIL” Albert. The best player overall was Tony Green. Three or was it two years of pure genius? A fair bit better than Beardsley who was a class act. TONY GREEN is the man. BEARDSLEY WITHOUT A DOUBT! GO ON PETER SON! DANCE PETER SON! In my time it has to be that handsome devil, Pedro. He scored enough, but I don’t think I can remember anyone making more goals than him for the likes of Keegan, Cole and the rest. A true artist and visionary. In the 1950s Bobby Mitchell, for me better than Stanley Matthews. In the 1960s Jim Illey, great sidestep,cultured player. In the 1990s Lee Clark,never understood why we sold him. recently, David Ginola that goal he scored when he hooked it over his marker then volled into the goal still make the hairs stand up on the back of my neck when it shown. looking forward to tne next 50 years !! BEN ARFA!!!! Oh wait he’s not signed yet. Shearer for me, grew up watching him and loved every second of it like. Best striker England has ever produced. Off topic lads but I’ve been a bit out of touch this weekend. What happened with Marseilles president/BenA’s agent Saying he’d be a toon player by next week? Aye, he does get forgotten considering he was such a great player. He kind of looked like a car thief skulking ’round the Scotchie Road when he was off the ball though, which tended to fool some people that he wasn’t as great as he was. Head says Tony Green, the most complete footballer I have ever seen. I could wax lyrical for hours – I won’t…..
Heart says Jimmy Smith, an artist, a genius – I have seen grown men cry just because of one defence splitting pass (nobody could pick out a man like Jinky) and crowds swoon in unison as he left three or four of the opposition kicking out at fresh air. Never broke into sweat, never had to. Worky I am again really surprised I thought he played a lot more and we had him for longer than we had :lol: wonder if its an age thing with me :) playing tricks with my mind. Did you ever see Len White play. Dad used to say he was a genius. One who is totally overooked and gives 1,000,000% with us,leeds,blackburn or england… David batty. Not the greatest footballer but probably the reason we were so good back in the day. always loved him. Beardsley was the best technical player i’ve seen. and for excitement/trepidation tino. Never knew weather it was a hat-rick=barca or red card=cov. yes saw him play, your Dad was right he was exceptional never thought he got the recognition he deserved probably because he took over from Jackie Milburn. Alan Sharer, of course! What the hell are you guys talking about! Alan Shearer#9 Captian Fantastic! Maybe the best striker in the world at any time! Richie-well I guess we’ll have to just wait and see but I’m surprised they’ve went public with it should that be true. Not gonna get my hopes up but it’d be pretty impressive. I loved the way Psycho used to put right wingers off trying to go round him by ‘fairly’ putting them into row z at the first opportunity! Cmon kris it’s our favourite player not who we thunk was the best player!! That would be a hot topic wouldn’t it!! I don’t know why it’s rob lee but it is, and for that reason the number 7 shirt is hallowed for me!! Probably why i stick up for Barton so much!!! Keegan lost us the League with Batty. It wasn’t Batty’s fault though. I thought the club made a statement saying if anyone went public regarding transfers they would pull out of talks? jay jay….it never works though,the only one that came out the blue was Routledge. Tony Green would have been an all time great i can still remember the night he got crocked what a tragedy. Remember jinky coming on as sub against i think Carlisle. Memory tells me we were 0-1 down. Was standing with Carlisle fans who couldn’t believe fans response to jinky. Warm up consisted of elbow on top of concrete dugout. Laid on equaliser and Carlisle fans were converted. He wasn’t Newcastle’s only great player, Kris. Hi guys,first time on the blog. my favourite player of all time has to be supermac! what an out and out striker. there was just an air of expectancy each time he had the ball,closely followed by tony green. anybody remember jinky jim? Jackie Milburn is still Newcastle’s record goalscorer, Josh. Shearer is the record league goalscorer thanks to World War II though, as Jackie’s 40 wartime goals didn’t count towards the total. Too young for jinky jim – you say he liked a beer, had an eye for the ladies and in his spare time played for the toon? I want his life so much……!!!! Anyone who doesnt say Peter Beardsley is an idiot. To all that never saw Supermac have a look at this. Shearer all day. Ledgend allways he is a toooon hero. SHEARER SHEARER SHEARER! In Newcastle’s history it has to be Milburn or Pedro. But for my generation and memory Alan Shearer. Of the last few seasons Jonas, he is the nearest thing we have at the moment to a class player. We will rely on him again at Man U, excellent workrate and talent. Goal against Barnsley was one of the best iv’e seen in person. what would he would cost today !!! If we are looking back in history, i.e. players that we have never personally seen then Hughie Gallagher has to be reet up there amongst the best. Now he was a pocket rocket. Beardo for me. We will never see a player like him again. Total genius. Some of the goals he scored defied belief, and isn’t it strange how every striker he played with scored tons of goals? It’s about time one of the real oldies on here mentioned Stubbins and Robledo too. That is yet another myth peddled by the press. Or I could forward you the dozens of emails from your fellow fans procaliming how special they all are. he truly is obnoxious and full of himself. did get to the 1976 League Cup final still depressed although the did play ok.
My Dad was brought up on Milburn, Mitchell etc and he also used to mention what a good player Len White was. I used to try and wind him up talking about who I thought were the best players around in my time – Wyn Davies, Jim Smith etc. I went off to College for a few years and on my return I asked him who he thought was the best Toon player he had ever seen. I expected him to refer to his past and was staggered to for him to reply Tony Green, a player who I am sad to have missed whilst I was away from Newcastle. Frank Clark knows my father,father knows Frank Clark….(LoL)! !Happy days! !CIRCA 68/69. I remember Robledo at the club, there was two of them which one do you mean !! The one game that sticks in my memory is vs Arsenal 1973 (I think). We were 0-1 down with 20 minutes left and Jinky was sub (only one allowed then!) as he had been out for weeks with the re-occurring knee cartilage problem. It all looked like lost cause and the crowd started chanting for Jinky (including the classic ‘we don’t need Eusabio, Georgie Best or Dennis law – cause we’ve got Jimmy Smith…’). Finally Joe Harvey relented, and on Jinky ambled (run? no way..!). He laid on the equaliser, and minutes later left Bob Wilson for dead with a screamer from the edge of the penalty area. 2-1 Newcastle – ecstasy. He then ambled off as if was a walk in the park and doubtless went to the pub. You had to be there, I guess. If not the best, he was certainly the coolest. Him, Greeny, Pedro and Tino in the same team… I have to lie down. Nodrog 108- My father (who has now sadly passed away) was totally with your father he watched them all-up to 2003 from the 50’s. Tony Green was his best! So there’s me vote for you dad- god bless! Bill Appleyard, the hardest man ever to play for the Toon. Even harder than McNamee……. Aye, you’d need to be about 110, Icedog. Nee Sky HD in those days, either. Spoylight Kid. I am impressed your spot on. WORKY what about jimmy lawrence played 496 games in 17 yrs for the toon never scored a goal. My favourite player was Dave McCreery — no nonsense and won the ball and a 5yd pass let the flair players destroy the opposition. The original Claude Makelele!! I’ve read alot of stuff about Newcastle, Les. I only go back to about 1974 though, when I was about ten and I got introduced to Malcolm MacDonald. “WORKY what about jimmy lawrence played 496 games in 17 yrs for the toon never scored a goal. On the subject of goalies, what about Ronnie Simpson? The man who put newcastle united on the map twice Kevin Keegan. Most bloggers are quite young so they will select from those who they have watched in the last twenty years when the Toon had their best team in 1990s. The usual suspects crop up…Shearer, Ginola, Beardsley, Lee, Gascoigne etc. Many will not have heard of Tony Green who only played for the Toon for a couple of years in the early 70s when they had an average team. Just look at this blog and see how often the name Green gets mentioned by the older generation who will be outnumbered by the youngsters on this blog. That says everything about Green who would have been a legend alongside Shearer, Milburn and Gallagher but for injury. He could not score goals like them but he was a much more skilful footballer. Genius. I’ve telt Icedog this already, Les. My Brother in Law used to be the manager of the Swallow Hotel in Newgate St at that time and he used to be a kind of landlord for Mac’s shop in the precinct at the bottom. I remember it was during the big sideburns phase. I’d have loved to have met Jinkin’ Jim too! My mate tells used to tell me that Jinky was a cabbie and a big one at that. Without a doubt – TONY GREEN! When Leeds were in their prime, cheating their way to title after title, they came to St. James for a midweek game. Green single-handedly dismantled their Bremner, Giles etc. midfield, humiliating them for 90 minutes… 1-0 to United! for me is robert lee, i cant describe it, it was just like real love you just knew and felt it plain and simple. Or king Pedro, to give him his true monika, Geordie legend, all rounder. Followed by a whole host of legends: wee hughie, Milburn, Supermac, Shearer, etc,etc, too many to mention. But ALL behind Pedro, what a player! Either Rob Lee or Shay Given for me! Both picked up on the cheap and performed with Newcastle in their hearts for over a decade! Although Given leVing annoyed me’… It wasn’t hard to see that he was unhappy to have to do it… Both adopted Geordies and both black and White legends! For me it’s gotta be Shearer. When I first started watching English League Football (Soccer, I am a yank after all), I didn’t have a clue what team was what and who was where. But, I remember being fortunate enought o watch Shearer bury a few golden beauties and thought, I think this team is for me. That, and I happen to love Newcastle Brown Ale…but seeing Shearer put some talented shots into the back of the net sealed the deal for me. Since Shearer, I have to say that Jose Enrique is quickly winning the race for 2nd. I love his work rate. I have to say Andy (Andrew) Cole as I’ve never seen the Toon blub so much over losing a player, how quick we forget that he and Pedro had the highest goals to game ratio as strike partners, followed by Pedro and Sir Les. Being of the younger sort i’d say Speed or Lee, though whovever said Emre made me realise I’d totally forgotten about him, and I’m not sure how. Good times (mostly) even of he might have been a bit of a racist..Well it was never proven..
Hello guys, my first time on here as a poster but have been a regular reader in the past. My all time favourite is Tony Green, the most complete player I have seen in a black and white shirt. He was an absolute magician. Loved Jinky Jim too, but a very underated midfieder at the time was Tommy Cassidy. My favourite is Alan Shearer. No doubt. He is the reason I follow Newcastle United till today, it’s been more than a decade living here far in Malaysia. Many names mentioned here which I do not have the privilege to watch. I just like his celebration…..! There have been some truly great players playing for the toon in the last 30-40 years the likes of Shearer, Keegan, Waddle Gascoigne, Beardsley, Ginola, Ferdinand, Lee, Asprilla, Albert, Supermac, Tony Green, Hibbit, Moncur, Wyn Davies, Pop Robson, Alan Suddick etc, etc. But being a lot older than most people who come on here for me it has to be Wor Jackie Milburn without doubt a truely great player and a true gentleman. He has to be number 1.
the more i read stories about ben arfa the less confident i get about him signing.from what im reading he isnt gonna come to england till later this week cos he joins up with france today.he also went to germany to speak with hoffenheim and rejected them.he could do the same to us.i think the worst thing that could of happened is marseille losing and ben arfa looking there best player it makes the fans want him to stay and gives his ego a boost.i wouldnt be surprised if he stars for france on wednesday and that he stays in marseille or goes to a major team.i hope im wrong and the deal goes through but its dragging on a bit. Does anyone remember the screamer Supermac scored against Leicester in the Leazes end, 50 yard strike going at least 400 mph ..or so it semed !? Even the Leicester goalie Mark Wallington applauded the goal ! Cannot find any tv replays of this goal, but absolutely brilliant – that was Supermac !!…p.s. not to forget that this goal was with a proper caser, not the puffs balls that we have now adays ! munich, got to say got a big soft spot for soopermac, was watching him in the leazes when I was only 12 or 13 , with stewy barracluff, and all the mags , I rem ember him when we beat burnley 2-0 in the semis of FA cup typical soopermac goals roonding the keeper and slotting it home , great !! It’s too hard to pick just one! I think the list of players you give us to vote on should be allocated votes from 1 to 10. Then see who comes out on top as a lot of players might slip into peoples second choice. For me I think Supermac would have to be first but followed very closely by Solano, Tony Green, Beardsley, Shearer, Shay Given, Jonas Guttierez,Kevin Keegan etc. Maybe not the best players ever but I adored Albert, Parker, Hislop, Batty etc etc the list just goes on and on! Thanks for the trip down memory lane. Got to be Peter Beardsley for me – closely followed by David McCreery. Also like to give a mention to Paul Goddard. Yep, got to go with Peter Beardsley as well, followed by Shearer, Nobby, Rob Lee, Gary Speed, Andy Cole, Sir Les, Albert, Tino…..
shearer was my footballing hero.since the age i properly started to understand football i have revered him as my idol. in my opinion he should be considered in the pantheon of greats of his era, figo,zidane et al.though he is an icon he would have had legendary status if he had just joined a big club such as man utd, but he didn’t and instead chose to stay true to his roots by joining newcastle.he often carried our team in many ways.he always wore the geordie strip with pride and carried our banner with pride,humility and honour.he is for want of an analogy, what raul is to real madrid and spain.both are club legends and greats for their country who have similar characters. shearer is the greatest player to wear our strip purely for the reason that he did it so brilliantly.nonetheless i am sure beardsley goes up there but i wasn’t born when he was really strutting his stuff. Richietoon @168, you got me sussed mate….old slapper…! Also you cannot get better than 3 goals from Tino Asprilla against the mighty Barca. Each of his headers were absolutely brillant ! Beardsley was also brilliant…Ginola too…Jinky Jim too….wow this is dificult…! As a non-NUFC supporter I have to say I used to love Peter Beardsley. In fact, I think at the time he must have been one of the most popular players with fans right across the country (except maybe with your mates down at Roker Park): not only was he a delight to watch but he was a good honest player with no ego or attitude. Always did well for his country too. scott sellars purely brazilian ,sweet left foot,darren peacock nut and boot center half,rob lee a nobody till he came to us but shearer for me not enough superlatives to describe the man !!!!!!!!!!!!!!! No9 would mean nowt if Milburn hadn’t wore it. It is great to see my choice of Tony Green early in the forum has been supported by so many folk. It was also mentioned in the “first 100 years” video too.Tony was so skillful, I remember a fantastic dribble and shot resulting in a goal in a mid week game against Birmingham,I think.Best goal I have ever seen,in the 42 years I have been watching NUFC. I was lucky enough to meet Tony when he worked as a PE teacher at Whickham refereeing a basket ball match again my school Tanfield. Football’s loss was teaching’s gain !! David @ 185 – are you a time traveller? can you take us back in time to befor Cashley arrived so we can explain his mistakes and change the course of history?